Cotoneaster - Trailing, or erect, shrubs of the highest garden value, with a great variety of habit-little things to crawl over walls or rock gardens, and also medium and most graceful shrubs like horizontalis, and brilliant fruiting trees like the Indian C. frigida, coming in among the ornamental trees. The cultivation is usually very simple, the plants thriving in any soil, and easy to increase by seed or division of the dwarf creeping kind. Hardy and close in growth, they are among the best shrubs for exposed situations. As fence plants they have been advertised, but I found them of no use in that way. Cotoneaster Adpressa - A new, and as yet rare, kind, forming a low, dense, spreading shrub. It is related to C. buxifolia, with flowers resembling those of C. horizontalis-i.e., white, with the extremities of the petals rose. The fruit is a brilliant red, and ripens in August. It is likely to be a valuable shrub for the rock garden. China. Cotoneaster Angustifolia - A new kind, 3 to 5 feet high, with spreading spiny stems, loaded with brilliant red berries, persistent throughout the winter. If this plant proves hardy in our winters, it will be of great value in gardens. Cotoneaster Bullata - A shrub reaching 3 to 4 feet in height, with a somewhat drooping habit, bearing berries of a dark blood-red color. A distinct, new, and deciduous species, with blistered leaves (bulle); the flowers white and borne in corymbs; fruit brilliant and about the size of a Pea. Thibet. Cotoneaster Buxifolia - A free-growing bush that at times attains the height of 6 feet, forming a rather wide-spreading bush, the branches clothed with deep green box-like leaves; the crimson berries, nestling in profusion among the leaves, are pretty in autumn. Cotoneaster Francheti - An erect-growing handsome shrub, 4 to 5 feet in height, stems at first covered with white hairs, then brown. It flowers in June, white, marked with red on the outside of the petals; the berries, light orange in color, appear in September, and last during a great part of the winter. 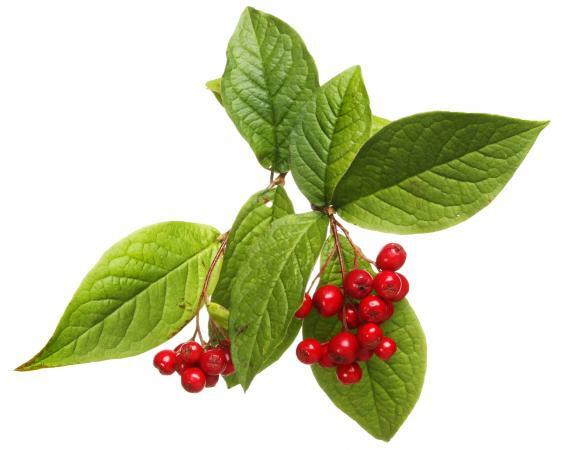 Handsome in form and berry, and likely to be very useful in gardens. Yunnan. Cotoneaster Frigida - A low tree reaching 20 feet or more. During mild winters some of the leaves will be retained throughout the year, while if the weather is very sharp it will become quite bare, the showy fruits being of a bright crimson. If untouched by birds, the berries retain their beauty a long time; but if the weather be severe, they soon disappear. Mountains of India. It is useful for grouping here and there, its main value, however, being from the beauty of its richly-colored fruits in autumn. Himalayas. Certain other allied Indian kinds, without being any better in effect than this, such as C. affinis, C. baxilaria, all free-growing, hardy, low trees. Cotoneaster Henryana - A sparse-habited evergreen species, reaching 10 to 12 feet high. The finely-pointed leaves are roughish to the touch, dark green above, greyish beneath. Flowers white in June in corymbs. The brownish-crimson fruits are egg-shaped. Good plant for a wall. It is allied to C. salicifolia, and not infrequently referred to as a form of C. rugosa. C. China. Plumed Cotoneaster (Cotoneaster Horizontalis) - In this the branches are frond-like and almost horizontal, while the small leaves are regularly disposed along the thick, sturdy branches. A charm of this species is the manner in which the leaves die off in the autumn; frequently the leaves will be of a glowing red color, with the exception of those on the tips of the shoots. The berries are very showy, bright vermilion, and the flowers pretty. China. Wall Cotoneaster (Cotoneaster Microphylla) - An evergreen clothed with tiny deep green leaves, in spring crowded with whitish blossoms, the berries crimson, and, if untouched, remaining on the plants for a long time. There are some well-marked varieties of C. microphylla. it is useful for sloping banks or like positions, while it will cover a wall with such a dense mass that nothing else can be seen. Again, in the larger parts of the rock garden a place may be found for it; and its variety congesta is more at home when draping a large stone than in any other way. Himalayas. Cotoneaster Pannosa - A free and graceful kind, a native of Yunnan, white flower and a woolly calyx, and a red, pear-shaped fruit. Cotoneaster Rotundifolia - like the preceding, but with thicker branches and rounder leaves. The berries are of a brighter tint. Both these species may, where a group of the larger Cotoneasters is planted, be used for the outskirts of the clump. Cotoneaster Simonsii - An erect, woody shrub of medium height, with long slender branches and shoots covered with stiff hair. The blossoms appear at the beginning of July, borne singly, or at most in umbels of twos or fives, white with red stains; the fruit, bright vermilion. I have found this a poor kind for effect, only useful as an undergrowth, and poor at that. It is much overplanted. 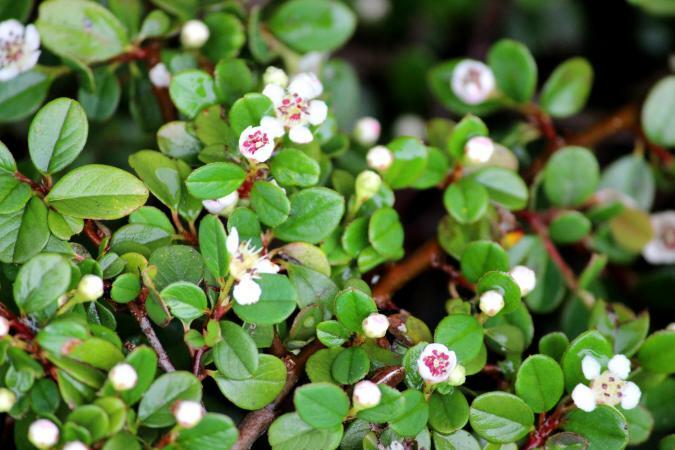 Thyme Rockspray (Cotoneaster Thymifolia) - A small shrub, bearing the smallest leaf of the family. The shoots, at first covered with soft hairs, soon become smooth and red-brown in color. The flowers and berries are smaller than those of microphylla. Himalayas. Cotoneaster Zabeli - A loose-habited bush of a sub-evergreen character, clothed with ovate, pointed leaves, each about a couple of inches in length. The berries, borne in great profusion, are of a brownish-crimson tint. Rockspray is available in so many varieties that there's bound to be one that appeals to you. Consider adding one of these hardy specimens to your own landscape.